For weeks, Jacobi Bedenfield, outgoing Santa Fe College student body president, campaigned against two other candidates in hopes of becoming the new State President of the Florida College System Student Government Association. At the end-of-year Conference April 6-7, Bedenfield continued his campaign and gave an inspiring speech that outlined his vision and platform to the near 400 students present at the conference. On the final day, he was announced as the new State President of the association. In this role, he will represent the nearly 1 million Florida State and Community College students before the Florida Legislature. 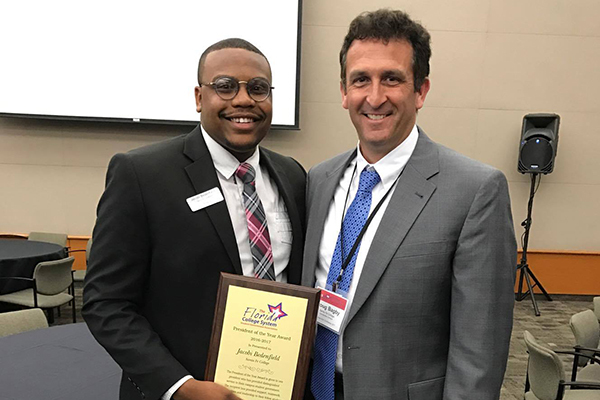 During the conference, Santa Fe College’s Student Life Associate Director, Dr. Doug Bagby, received the District 4 Advisor of the Year Award for his work as the student government advisor.